Came across as a positive song, but here we are – more than four decades down the road – and it sounds more like a warning. While “karma” seemed like a cool word, with its groovy Age of Aquarius thing going on, it might be the word “instant” that resonates as a negative. We have instant messages, instant food and instant replay. In the sports world, we have something more insidious. We have the scourge of instant glory. Good athletes are dubbed “great” and, in some cases, instant cases are made that they are among the greatest of all time at their given craft. Greatness, in the sports context, really shouldn’t be a matter of boiling some hot water and pouring into a powder of instant oatmeal. And it cheapens the definition. It equates to erecting a golden calf in lieu of instant answers while the obvious rules of law on these matters are etched into a tablet for posterity. Halls of fame purposefully build in a waiting period, as they are designed to store only the legacies of the greatest of the great. Time – with hindsight, reflection and some meditation – needs to pass. Individual sports franchises, however, can operate with a lowered bar and more gray area. They can go more with their gut, and do with increasingly mixed and sordid results. Franchises grant immortality to their icons is by retiring uniform numbers. Many also have their own versions of halls of fame. And, without much rhyme or reason, they can do what they want within their fiefdoms. If that means honoring a player who recently retired, which gives current fans instant attachment without having to search their memory banks or page through history books, so be it. Time, and its natural portals and passages, gets snubbed. Which brings us to Donovan McNabb, the longtime Eagles quarterback who perfected the art of getting his team to the big dance – often while looking spiffy in a tux and limo – only to stand in a corner and become a wallflower once there. On Thursday night, largely based on McNabb’s statistics – accrued in a pass-happy offense in a pass-happy era – he will be honored at halftime before what will likely be a tepid crowd. Why now, when the ink isn’t even dry on his official retirement papers? His old coach, Andy Reid, is in town as the first-year guide of the Kansas City Chiefs. It’s on national television. It’s an event.More Broadway than Broad Street. It gives Eagles Nation something to cheer for after a 4-12 nightmare of a season; something to make them feel the emptiness of instant joy during what looks to be two or three more years of rebuilding in the wake of what Reid left behind. McNabb, based on his tenure – 1999 to 2009 – and aforementioned stats, which include 14 franchise passing records, deserves a halftime ceremony at some point. He did get the team to five NFC title games and one Super Bowl, even though he came up empty in the Lombardi Trophy department. Tastes like instant coffee instead of brewed. Moreover, they are not just bringing him out onto the field to be recognized, followed by a place in the team’s own little Hall of Fame, which is a rather harmless waltz. They are going one step beyond, and across the line. 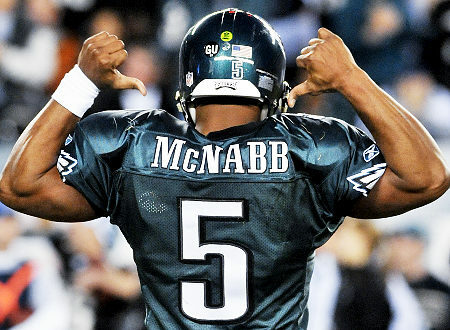 They are going so far as retiring McNabb’s No. 5. It is a major stretch that borders on embarrassing. When you go into any stadium or arena in this sports-crazed town, one common thread is that the retired numbers hanging from the rafters are beyond reproach. Even with the passage of time. Even when Timmy Jr. has to ask Timmy Sr. who the player is or was and what that player accomplished. The father-son exchange happens with a lump in the throat and goose bumps. 76ers: Julius Erving, Maurice Cheeks, Wilt Chamberlain, Hal Greer, Bobby Jones, Billy Cunningham and Charles Barkley. Phillies: Richie Ashburn, Jim Bunning, Mike Schmidt, Steve Carlton, Robin Roberts, Grover Alexander and Chuck Klein. Flyers: Bernie Parent, Mark Howe, Barry Ashbee, Bill Barber and Bobby Clarke. Eagles: Steve Van Buren, Brian Dawkins, Tom Brookshier, Pete Retzlaff, Chuck Bednarik, Al Wistert, Reggie White and Jerome Brown. And Donovan McNabb, the first quarterback of the bunch. Not Norm Van Brocklin (1960 championship). Not Tommy Thompson (1948 and 1949 championship teams). Not Ron Jaworski, the signal-caller on the other Super Bowl team that came up short. Rings hollow, like a riddle that fails to rhyme. Cull together a 10-person panel – drawing from national and local media, Elias Sports Bureau numbers crunchers and fans ranging from old to young and casual to intense – and you will get 10 viewpoints on McNabb’s legacy, whether it is fair and just to retire his number and if he is even a remote candidate for Canton, Ohio’s Pro Football Hall of Fame. Just the fact that that opinion would be split should tell you all you need to know on whether he is worthy. Could you imagine the same vibe when the Phillies retire Chas Utley’s number one day? If the answer is no, then it should be no to McNabb. To be fair, Donovan McNabb was a good quarterback. He was the NFC Player of the Year in 2004, the same season the Eagles went to the Super Bowl, where he threw three interceptions in a 24-21 loss. He was in six Pro Bowls, although several appearances were as an alternate in place of quarterbacks who advanced deeper in the playoffs. He had his chances to be great and, like so many others whose numbers are never even on the radar to be retired, and let a lot of people down. His penance should be an acknowledged legacy a step shy of a retired number. But that’s not what is happening. We are in an era of instant everything, so we are being forced to swallow a microwaved legacy that has yet to be digested. In an 80-year franchise history, one quarterback whose admirable physical toughness – his willingness to take a hit or play hurt, failed to match his mental toughness when it came to big moments – is not to blame for the 53-year drought since the last championship. But he should not be honored without the proper passage of time. And no instant recipe can make it taste sweet. This entry was posted in Sports on September 19, 2013 by gordonglantz.